Weather – Welcome to Wyandotte Daily! Today’s high will be near 76 as a weak cold front moves through the area, according to the National Weather Service. A south southwest wind of 10 to 14 mph will become west in the afternoon, the weather service said. Tonight, it will be mostly cloudy, with a low of 49 and a north northwest wind of around 11 mph, according to the weather service. Tuesday, it will be mostly cloudy, with a high near 63 and a north northeast wind of 9 mph, the weather service said. Tuesday night, it will be partly cloudy with a low of 48, and a northeast wind of 5 to 7 mph becoming calm in the evening, according to the weather service. Wednesday, it will be mostly sunny, with a high near 72 and a calm wind becoming east around 5 mph, the weather service said. Wednesday night, it will be partly cloudy, with a low of 52, according to the weather service. Thursday, it will be mostly sunny with a high near 77, the weather service said. Thursday night, it will be mostly clear, with a low of 52, according to the weather service. Friday, it will be sunny with a high near 74, the weather service said. Friday night, it will be partly cloudy, with a low of 56, according to the weather service. Saturday, there is a 40 percent chance of showers, with a high near 77, the weather service said. Saturday night, it will be partly cloudy, with a low of 55, according to the weather service. Sunday, it will be mostly sunny, with a high near 75, the weather service said. With high winds and dry air, there could be high fire danger in some areas today, according to the National Weather Service. In areas where there is a lot of dry brush, grass or leaves on the ground, there is a possibility of fire danger today. Winds will be from 9 to 16 mph today, gusting as high as 24 mph, in Wyandotte County, the weather service said. Humidity was at 66 percent at 9 a.m. and will dip to 35 percent around 2 p.m. today in Wyandotte County, according to the weather service. Conditions will improve near sunset. Temperatures will reach a high near 64 today, with sunny skies, the weather service said. Thunderstorms will be in the forecast for Sunday night and Monday. Tonight, the low will be around 40 with a north wind of 8 to 13 mph becoming light and variable after midnight, according to the weather service. Saturday, it will be sunny with a high near 74 and a southwest wind of 5 to 10 mph, the weather service said. Saturday night, the low will be around 55 with a south wind of 10 mph, according to the weather service. Sunday, it will be mostly sunny with a high near 79 and a south wind of 9 to 15 mph, gusting as high as 25 mph, the weather service said. 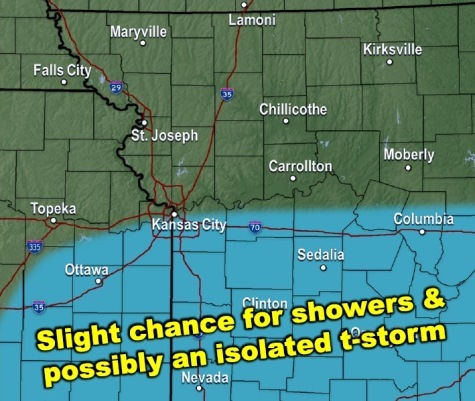 Sunday night, there is a 30 percent chance of showers, then a chance of showers and thunderstorms after 11 p.m., according to the weather service. The low will be around 61. Less than a tenth of an inch of rain is expected. Monday, there is a 30 percent chance of showers before 8 a.m., with a high near 74, the weather service said. Monday night, it will be mostly cloudy, with a low of 54, according to the weather service. Tuesday, there is a 30 percent chance of showers after 2 p.m., with a high near 67, the weather service said. Tuesday night, there is a 40 percent chance of showers, with a low of 51, according to the weather service. Wednesday, there is a 30 percent chance of showers, with a high near 69, the weather service said. Wednesday night, it will be mostly cloudy, with a low of 52, according to the weather service. Thursday, it will be mostly sunny, with a high near 74, the weather service said.